I’ve been enchanted with the idea of gourmet fried chicken and doughnuts served under one roof ever since I got wind of Philly’s Federal Donuts and D.C.’s Astro Doughnuts & Fried Chicken. After two years of praying to the deep-fried gods to bring this delightfully gluttonous trend to Southern California, my wish finally came true. Hello, StreetCar Merchants. 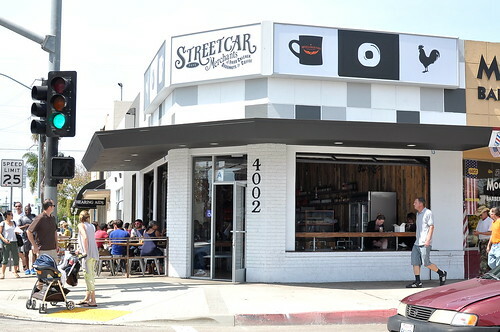 Opened by RaVae Smith and Ron Suel late last year, StreetCar Merchants serves up three things: fried chicken, doughnuts, and coffee. The Astronomer and I, along with Cousin Danny, indulged in two of the three specialties on a recent Sunday afternoon. Since the fried chicken takes nearly half an hour to prepare, we tucked into three doughnuts while we waited. 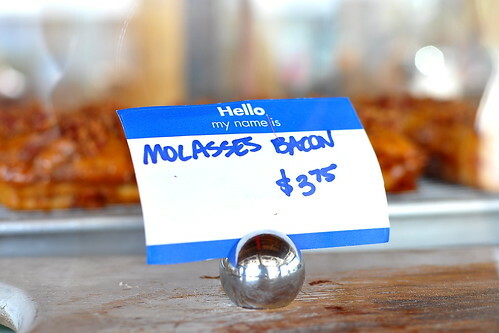 The shop makes 12 varieties each day, all of which are brioche-based and fried in rice bran oil. 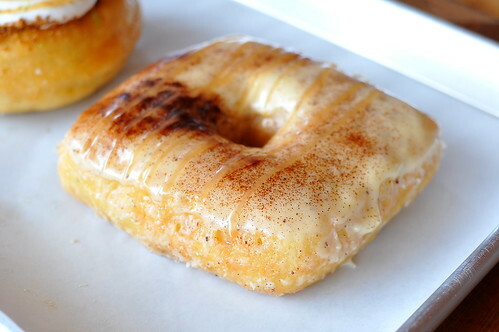 The Brown Butter Salted Caramel ($2) doughnut was calling my name. The browned butter glaze, coupled with the brioche dough, made this one a seriously rich butter-on-butter situation. 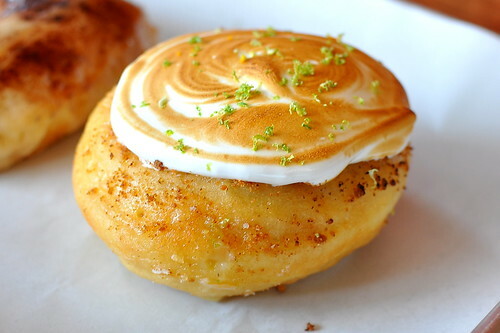 The Astronomer and I can’t resist ordering a curd-filled Bismarck when the opportunity presents itself, so this Key Lime Pie ($3) doughnut had to be ours. 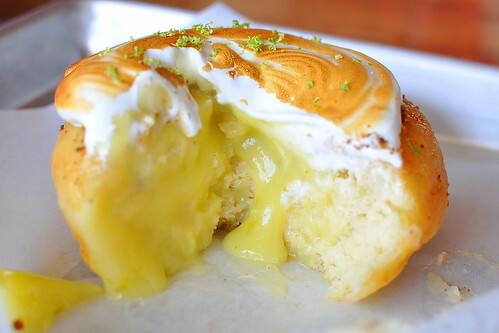 The beautifully torched meringue topping, sprinkled with fresh lime zest, gave way to a bright and tart citrus curd. This doughnut was our favorite of the afternoon. 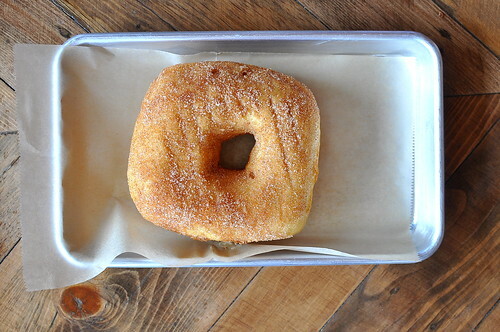 Our final doughnut was the Sugar and Spice ($2), which was dusted with cinnamon, cardamom, and nutmeg. While this one didn’t have as many bells and whistles as the other two, it certainly held its own. The fried chicken arrived just as soon as the final doughnut was polished off. 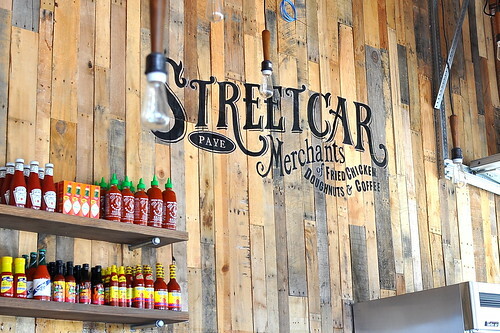 StreetCar offers three different preparations, all using Mary’s free-range, organic, air-chilled chickens. We ordered a “quarter bird dark” of each variety. 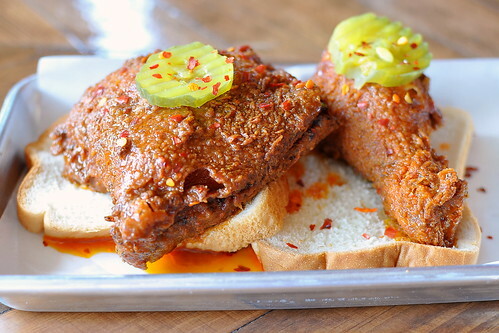 First up was the Nashville Hot Chicken ($9), a classic Southern fried chicken brushed with a cayenne pepper paste. Even though my tongue was burning and crying for mercy, the crisp batter and juicy meat had me going back for more and more. 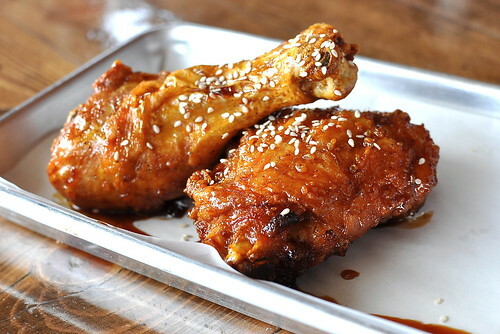 The Astronomer and Cousin Danny really dug the K-town Twice Fried Chicken ($9) with a sticky, sweet honey sesame glaze. The two rounds of frying produced a fantastically taut and crunchy exterior. 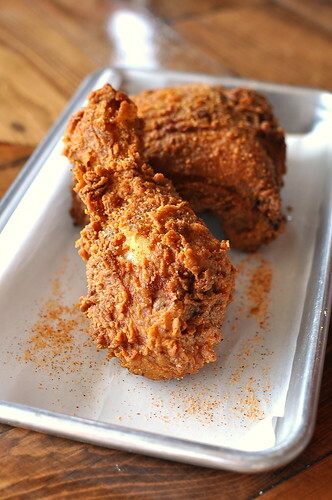 Also terrific was the Southern Fried Chicken ($7) made with Suel’s great-grandmother’s recipe. Well-seasoned and full of golden crags, this bird had it going on. For those whose hearts go pitter-patter at the thought of fried chicken and doughnuts, StreetCar Merchants is a worthy destination. Ouch, Michael. Looks like a copycat to me. Has the font been trademarked?